Next month Gurdas Maan arrives in the UK for his latest tour, Innovation World Tour. As always there is much excitement and anticipation. For all the many years, I have been attending his shows, they have always, without fail, been superb. Great music, high energy, crowd fully engaged with exhilarating performances. Without a doubt Gurdas Maan is one of the all-time best live performers. Year after year he continues to amaze and delight the audience not only with the sing a long Punjabi tunes but with the deep insight he has into the world around him. He has so many approaches to his music, but as he says himself, the songs can be started from anywhere, but they always end at one point. I wonder which Gurdas will perform this year, will it be the Punjabi popstar, the soulful Sufi or the social activist. I personally hope that it is the social activist Gurdas Maan. When he is in this frame of mind, his lyrics and deep wisdom set fire to the soul. He defiantly gives you food for thought. His words can be deeply provocative, stimulating, and sometimes even disturbing. The truth he speaks brings about an emotional response. It is a call to action. Now, more than ever we need strong passionate voices. Voices which have the power to inspire. Besides the continuing economic uncertainty, the health crisis, the pending ecological disasters. We have Brexit on one side Trump on the other, North Korea, ISIS, tensions seem to be building, nations seem to be dividing further and putting up walls higher, both metaphorically and physically. Gurdas Maan is one voice that has for many decades spoken about social change and revolution. He has constantly challenged others, and himself, to live a life of higher virtue and purpose. His recent song ‘Punjab’ has again brought him into the limelight. This controversial song looks at Punjab through the eyes of time and reflects on the current state of Punjab against the backdrop of the people, who have sacrificed their lives for freedom, in this case Bhagat Singh. Again he has been criticised by many. Why is he showing Punjab in such a bad light, oh he is only saying these things now because of the elections or this, that or the other. The truth is, Gurdas Maan has been saying these things for a very long time. This social activist voice is not something new, or for a particular time or audience. He is as artist. He has a unique way of seeing the world. It is to his credit he shares what he sees and feels with his audience in a way that kindles that flame of revolution. Many emotional evenings have been spent dissecting and analysing the deeper meaning to his songs. I suppose my interest in Gurdas Maan songs started in my university days. I was well acquainted with Gurdas’s popular Punjabi songs, but to be honest, I didn’t know what I didn’t know. I didn’t have an inkling about the depth of his wisdom. The Gurdas beyond the Punjabi pop music. That was until about the mid-nineties. Then I was introduced to a different, totally unexpected side by a friend of mine. When his family brought a new Gurdas cassette (yes, it was cassettes in those days) they would make duplicates to listen to and put the original in a safe box and keep it hidden in the attic. To say that caught my attention is an understatement. Why would you do that? I was intrigued what was it about Gurdas Maan’s albums that caused them to give them so much respect. I couldn’t work it out, I’d heard many Gurdas Maan songs before, what was I missing? Over the next few years I listened more intently. It was then that I started to realise that I had heard many of his songs, but I not really listened. For me, a Punjabi born and brought up in England, I had to learn to listen, really listen. Not just with my ears, but my heart and soul too. Only then did I begin to understand the richness and depth of his wisdom. The thing about Gurdas is that he creates a vivid picture of the message that he wishes to portray. This is a unique talent and true artist. Art is meant to inspire change. Gurdas defiantly provokes deeper thoughts and inspires change. He not only stands heads and shoulders above most Punjabi artists. Even on an International stage, there is few, who deliver messages of social change with such eloquence. Over the next few weeks, we will build up to his coming UK tour by taking a short journey through a few handpicked songs. Translations from Punjabi to English is notoriously difficult so this will be more of an interpretation. Only Gurdas Maan himself can tell you what he really meant by all his words. However, we will begin to see the depth of his poetry. We can begin with ‘Dharti Desh Punjab Di’. As we all have an interest in Punjab, it is a land of colour and vibrancy, of heroes, of lovers, of saints and soldiers. Punjab has also had terrifying deeds inflicted on upon it. There is the era of the Gurus and shortly after when many crimes were committed against innocent people. Then, for over 200 years, there was the British Raj. There have been many incidents in our history such as Jallianwala Bagh 1919, the partition of Punjab 1947 and the resultant deaths and deplacement of millions of people. In the 2016 film, Angrej, there is a scene. A young man is boasting about the freedom of India, an older gentleman abruptly corrects him. We didn’t become free he said, we didn’t gain our freedom, freedom came to us like a plague, it was thrust upon us. Gurinder Chadha in her latest film Viceroy’s House delves into these issues even further. These episodes in our collective history are ingrained in our psyche. 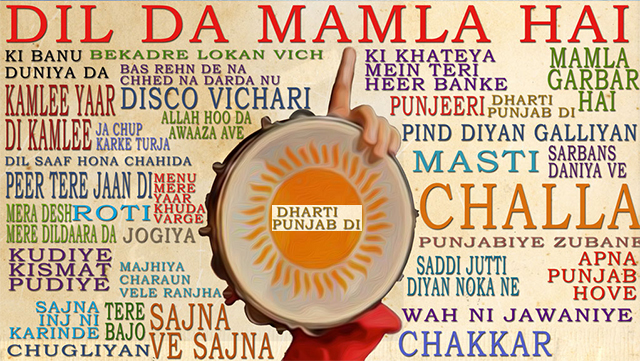 In Dharti Desh Punjab De, the down beaten of voice of Punjab speaks through Gurdas. I, the land of Punjab, lost everything, whilst I was meant to be thriving. I, the land of Punjab, the lone daughter of the 5 rivers, have been raped, pillaged and have seen many atrocities and crimes against my sons. I have been stripped of all dignity and virtue. I am a mother calling out to one of her sons to save her, come free me. A mother who will never forget the sacrifices of her freedom fighters. A mother who feels that during partition it was her own corrupt sons who tore her into half and made Pakistan, and her own people who raped and have continuously hanged her soul thereafter. Bhagat Singh took off his turban and covered my shame but you have even ripped that to shreds. Such powerful imagery and emotions are evoked. You can’t hear this song without being moved. Gurdas’s poetry speaks the truths as he sees them, his words aren’t universally popular. He often speaks against religious organisations or politicians and that can make powerful enemies. As you can see clearly in this song which is over 20 years old. Gurdas Maan isn’t jumping on the band wagon of social conscious music, with his latest offering ‘Punjab’, Gurdas is one of the pioneers of it. Venue: Woodville Halls, Gravesend – Sold Out!